Quilt history goes back a very long time from Ancient Egypt through the Middle Ages up until today not only in Europe but also in many other cultures. During these periods quilting appears to have been used primarily for clothing. Due to fabrics not surviving well over many years historians have looked at paintings, literature and sculpture to learn about the history of quilts. Below I have outlined a very brief summary of the history of quilting. I have to admit that I prefer creating history by making my own quilts rather than researching the past. 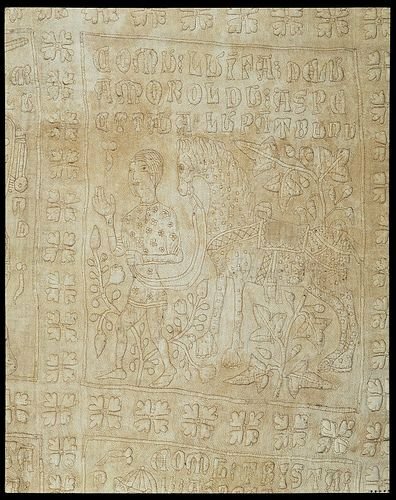 The oldest discovery, 5,500 years ago (35th century BC) is of an ivory carving, featuring the king/Pharaoh of the Egyptian First Dynasty wearing a mantle/cloak that appears to be quilted. It was found in the Temple of Osiris at Abydos in 1903 and is currently in the collection of the British Museum. There are rare examples of old quilts. One preserved quilt is a Sicilian wall hanging and was made in the 14th century. It is estimated to have been made about 1395. It portrays the legend of Tristan. This beautiful piece of art was made using quilting with trapunto (stuffed quilting) on solid white fabric. It is displayed in the Victoria and Albert Museum in London, England. It appears likely that quilting in the form of quilted clothing was brought to Europe through the Crusades. The victorious Muslims wore tightly quilted garments as part of their armor and this was soon adopted by medieval European soldiers. In southern France during the 17th century the making of decorative petticoats and other clothing became a popular folk art. These lovely crafted pieces were heavily quilted with floral and geometric designs. The petticoats were not hidden, instead the dresses were draped in such a way that the beautiful quilted petticoat could be seen across the front of the skirt. 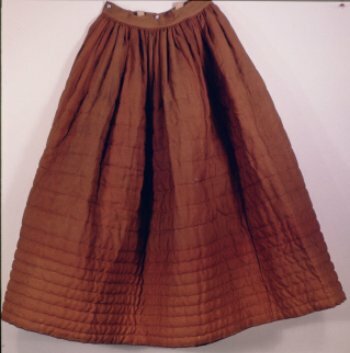 The hand-quilted petticoat below is made of nut brown twilled wool. The beige and red striped cotton lining has a small palmetto or paisley motif. It has medium wool batting and is hand-quilted in horizontal parallel lines with a few vertical lines at top. This photo is published with permission from Old Sturbridge Village, 1 Old Sturbridge Village Road, Sturbridge, MA 01566, USA. There appears to be several key factors throughout the history of quilts that have played a key role in developing the quilts as we know them today. Firstly, quilting fabric is a very old concept. For centuries the Chinese used quilted cloth to make padded winter clothing, wisely reasoning that two or three layers were warmer than one. Later, the Arabs were discovered wearing quilted garments beneath chain mail. Multiple layers of cloth sewn together provided additional protection and prevented chafing more effectively than cloth of a single layer. Some historians believe this quilted clothing, when brought back to Europe, provided the idea for the bed quilt as we know it today. Although fine quilting was a sign of affluence the sewing together of layers for warmth was done by the poor as well. If one couldn't afford carded wool or cotton to sew between the layers old blankets, clothing or even feathers, straw or leaves could be used instead. 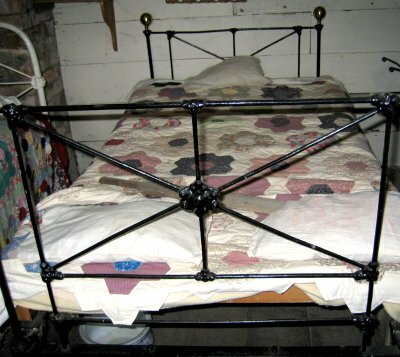 In English orphanages and poorhouses one form of crude bed covering was made by sewing paper into cotton bags. Secondly, the industrial revolution brought about the most dramatic change to quilt history as textiles began to be manufactured on a large scale. This meant women no longer had to spend time spinning and weaving to provide fabric for their family’s needs. By the 1840s the textile industry had grown to the point that commercial fabrics were affordable to almost every family. As a result quilt making became widespread. Thirdly, during this period the invention and availability of the sewing machine contributed to quilt making. In 1856 The Singer company started the installment plan so that more families could afford a sewing machine. By the 1870s a good many households owned a sewing machine. This affected quilt making in two ways. First of all women could make clothing for their family in much less time leaving more time for quilt making and secondly they could use their sewing machines to make all or part of their quilts. More often the sewing machine was used to piece quilts but occasionally the quilting was done with the sewing machine. When you create a quilt today, you become part of quilt history that stretches thousands of years into the past. A tradition that had its beginnings in Ancient Egypt, 3,400 BC. While researching quilt history I came across Beth McCrystal's Case Study Sergeant Ford's Quilt where she explains the process she went through creating a replica quilt for Sergeant Ford's cottage at the Howick Historical Village in Auckland, New Zealand. Each country has there own documented quilt history. Beth McCrystal gives us a view of what happened in New Zealand. Click here to view an insight into Canadian quilt history. At the time of writing I found it quite hard to locate information regarding Canadian quilt history so there is not much information added. There is a wealth of information about American quilt history. Within the last 10-15 years the Quilts of Gee's Bend have become known as a major contributor to American quilt history. Click here to view a selection of these beautiful quilts at the Shelburne museum in Vermont. In February 2012 Magdalena Wegrzyn of the Longmont Times published an article titled 'Longmont woman's 200-year-old quilt collection puts 'face and place' on history'. Here she interviews a local quilt artist, historian and American Quilt Society certified appraiser Jeananne Wright. Jeananne Wight began quilting in 1963 and then began purchasing old quilts. She now has one of the largest collection in the country. Click here to view a sample of this article.